Preheat oven to 375 degrees. Wash asparagus and snap bottom ends off. 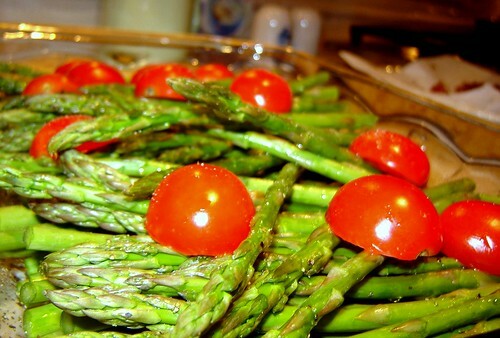 Toss asparagus with olive oil, lemon juice, salt, and lemon pepper. Place in a roasting pan, spreading the stalks into an even layer. Slice plum tomatoes in half. Place them skin-up on top of the asparagus. 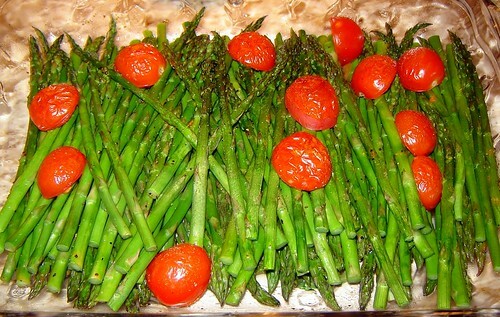 Bake in preheated oven for about 10-15 minutes – until asparagus is bright green and tomato skins begin to crinkle.